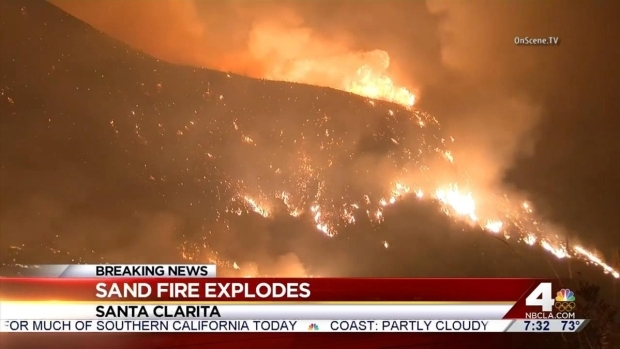 Residents in over 300 homes have also been evacuated from a fire that has consumed over 11,000 acres. As 20 and 30-foot flames shot up along the 14 Freeway in Santa Clarita, volunteers banded together to help evacuate exotic animals like monkeys, hyenas, and even bears Saturday. The 400 exotic animals living at the Wildlife WayStation in Sylmar cannot be walked out on a leash. So with just hours to evacuate, the staff turned to volunteers. Volunteers posted a plea to Facebook for help, asking for trailers, flat bed trailers - anything anyone could lend to help. Volunteers needed help moving monkeys, hyenas, tortoises, lions, tigers, and even bears. Steve Moody and his fiance Chairse Stuber were among the long line of volunteers who showed up to help. 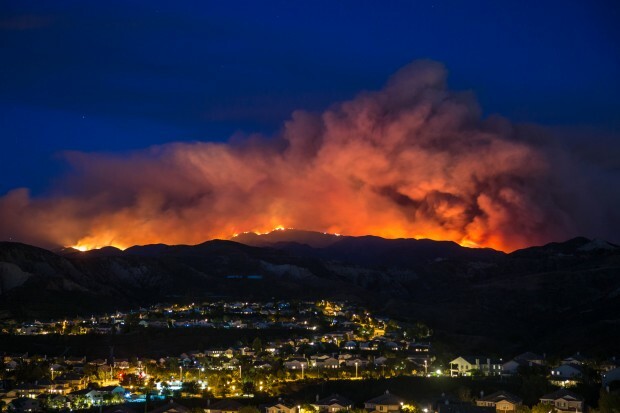 Residents evacuate over 300 homes in Santa Clarita due to a brush fire that broke out along the northbound Antelope Valley Freeway in Santa Clarita, California, and continued to burn Saturday morning with no recent containment by firefighters. Marin Austin reports for Today in LA at 7 a.m. on Saturday, July 23, 2016. "Just a love for animals - that’s why we’re here. We would want someone to help us if we needed it," Moody said. The staff said most of the animals were up for the excitement. But others, like the hyenas, had to be tranquilized in order to be transported. As flames continued to move quickly in the 20,000-acre blaze, the animals were off to various destinations, including a Van Nuys airport hangar in the meantime. "Our primary concern at the moment is getting the evacuation plan for the exotics at the Wildlife WayStation," said Aaron Reyes, Los Angeles County Department of Animal Care and Control's deputy director, referring to the 160-acre animal sanctuary at 14831 Little Tujunga Canyon Rd. in Sylmar. County animal control officials released the numbers on the animals and pets evacuated from the vicinity of the fast-moving brush fire. Most of the evacuees have come from the Hansen Dam area, where Los Angeles County Department of Animal Care and Control officers have been able to round up 228 horses, 52 goats and 29 chickens, Reyes said. Officials also gathered up seven rabbits, five cats and two dogs from the Castaic area, Reyes said. 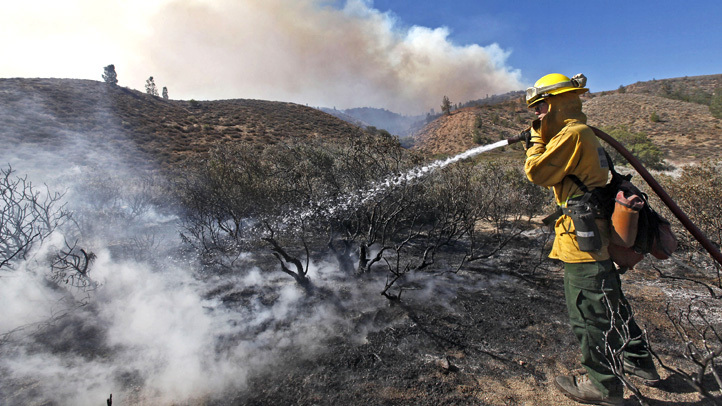 The so-called Sand Fire was 10 percent contained as of Saturday afternoon. It broke out at 2:10 p.m. Friday near Sand Canyon Road, along the northbound Antelope Valley (14) Freeway. As many as 1,500 homes were threatened. An emergency shelter was established at Golden Valley High School at 27051 Robert C. Lee Parkway in Santa Clarita. Shelter for large animals has been made available at Agua Dulce Airport, Wayside Jail in Castaic and Pierce College in Woodland Hills. City News Service and NBC4's Marin Austin contributed to this report.